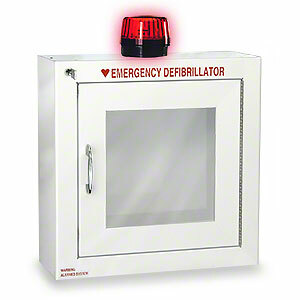 Our full line of AED cabinets are designed to keep your investment safe. Choose from a variety of wall-mounted cabinet styles including painted steel, finished steel, or even a hand crafted wood exterior. Select from a variety of sizes including compact “smaller” cabinets, standard size cabinets, or even a manufacturer-specific cabinet (like a Philips AED cabinet). Wall mounted cabinets for every application. This cabinet is perfect for smaller units such as all Philips AEDs, the Physio-Control CR Plus, the Welch Allyn AED 10 (without carry case), and the Heartsine Samaritan PAD. 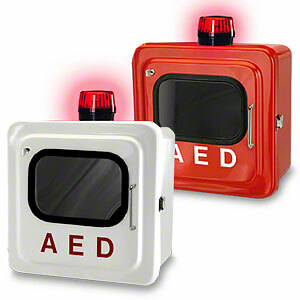 Sized for larger model AEDs or smaller units where extra space for addtional components or accessories is desired. When good looks matter, this sturdy and attractive cabinet is ideal for both indoor applications and covered outdoor applications. 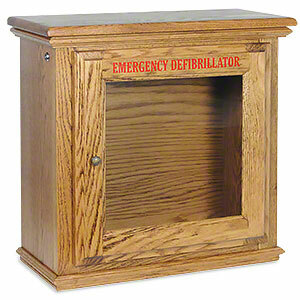 These hand-crafted wood cabinets make for an attractive yet functional way to protect and display your AED. The inside of these cabinets contain a proprietary mounting bracket for correctly centering the ZOLL AED Plus inside the viewing window. 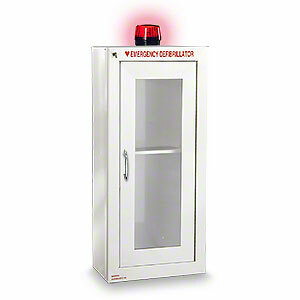 A taller cabinet version for storing both an AED and an oxygen delivery system together. The lower compartment is also ideal for a first aid kit. Made of non-corrosive fiberglass incorporated with a full-length rubber door gasket, these cabinets will resist the harmful effects of extreme weather. Find specialty cabinets and specific manufacturer brands here. These Fire-Rated Cabinets are "UL" rated, and are available in Semi-Recessed only. 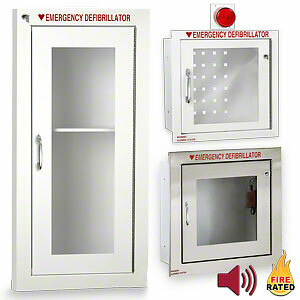 Designed for locations where building codes specify the necessity for fire-rated AED cabinets. 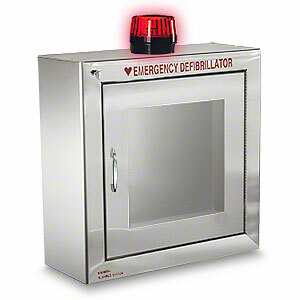 A sturdy AED cabinet (or AED mounting box) will deter theft, tampering, and the elements. 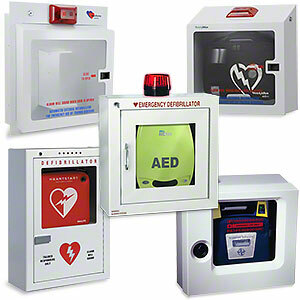 We carry a number of AED cabinets with and without alarms, wall mountable, and made in a variety of materials including wood, aluminum, and stainless steel. All of our AED wall cabinets are designed to protect the investment you've made in emergency preparedness while making defibrillator access easy in case of an SCA emergency. 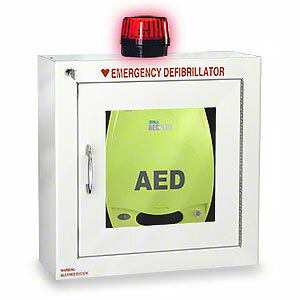 Virtually all of our AED cabinets are made in the USA with high quality components. You can count on them to handle a variety of situations including outdoor AED storage and usage, fire-resistance (specific models), and more, as well as last for years to come. 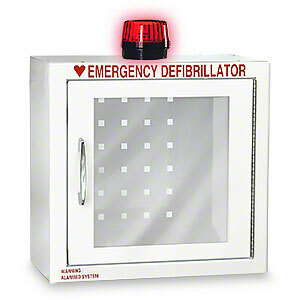 We get many questions about AED Cabinet alarms. In the video below, we answer some of the most common ones, including "what does the cabinet alarm sounds like?" and "how often do I need to replace the alarm's batteries?" If you have other questions on cabinet alarms, don't hesitate to contact us. Please Note: Alarm cabinets are 9V battery powered (battery included) and do not require to be plugged into an outlet.